Extract from "Take Five - The Private and Public Lifes Of Paul Desmond"
©Doug Ramsey. Reprinted with the permission of the author; copyright protected; all rights reserved. After “Take Five” became one of the most familiar pieces of music in the world, Desmond tired of questions about it and amused himself by concocting stories about the piece’s origins. His favorite version linked it with his gambling habit. He told people that he was inspired by the rhythmic sounds that slot machines make—down, back, click-click-click. 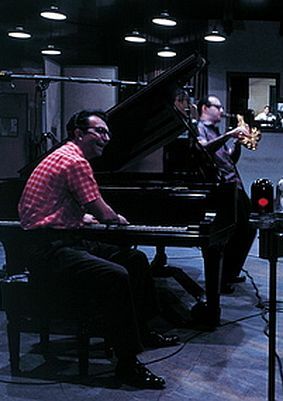 The question of initial inspiration for “Take Five” aside, in a 1976 interview on Radio Canada, Desmond gave Brubeck ultimate credit for the rad­ical idea in 1959 of recording an album of pieces in unorthodox time signatures. 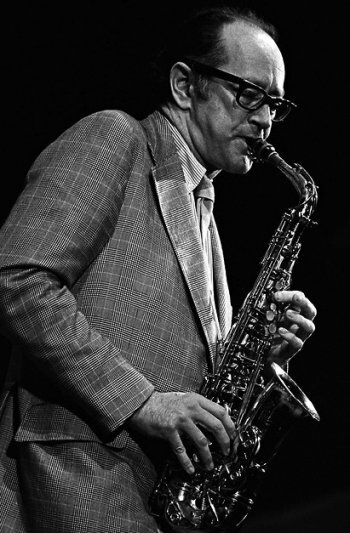 Brubeck had written for the Octet in unusual meters as early as 1946. “I still think, basically, it was a dubious idea at best,” Desmond said, “but at that point we had three or four albums a year to get done, and we’d done all our tunes that we’d put together, and standards and originals of Dave’s and he said, ‘Why don’t we do this album and do all different time signatures?’ And I said, ‘Okay.’ I was always argumentative. And, for some reason, I lucked out. I really did. It was sort of like Keno. “I had the middle part kind of vaguely in mind. I thought, ‘We could do this, but then we’d have to modulate again, and we’re already playing in 5/4 and six flats, and that’s enough for one day’s work.’ Fortunately, we tried it, and that’s where you get the main part of the song. The bridge is a chromatic reduction of the opening phrase of the Johnny Burke-Jimmy Van Heusen popular song “Sunday, Monday, or Always,” a 1943 hit for Bing Crosby, a piece that Desmond frequently quoted in solos. His adaptation of it is in ideal contrast to the first theme and creates an exquisite balance between the two sections. “Take Five’s” popularity came as a surprise to everyone involved; Desmond, who composed it; Morello, who inspired it; Brubeck, who, as Morello requested, “kept that vamp going;” Wright, who loved playing in 5/4; and, most of all, Columbia Records, which hated the idea until the company realized that it had been looking a prize-winning gift horse in the mouth. Nonetheless, the song did not hit immediately. Columbia President Goddard Lieberson ordered a single of “Take Five,” with “Blue Rondo a la Turk” on the other side, but it took Columbia eighteen months to issue a version edited for juke boxes and radio airplay. Brubeck asked Columbia to push both tunes equally, but Columbia argued that there had to be an A side and a B side. The company decided to make “Take Five” the A side because the title was catchy and “Blue Rondo a la Turk” was too long for juke box menus. It was not until 1961 that “Take Five” be­came omnipresent at home and abroad. Despite Brubeck’s characteristic optimism, it was a monumental, and rare, instance of music triumphing over conventional wisdom and the accounting mentality of the record business, and it happened in the nick of time. Within a few years of “Take Five’s” success, the segmented popularity-charting of the music industry, targeted marketing practices of record companies and mandated playlists at radio stations had strangled the possibility of an unconventional record driving its way to the top by force of its musical merit and attractiveness. The disc jockeys who exposed “Take Five” to a receptive public simply because they liked it were soon to lose their freedom to choose the records they played on the air. 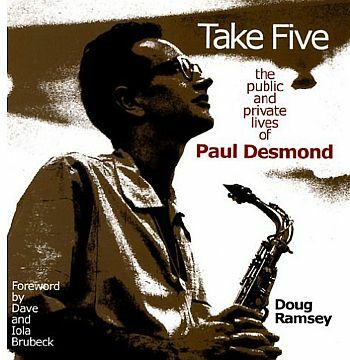 "Take Five - The Private and Public Lifes Of Paul Desmond" is available to purchase from Parkside Pubblications.